Dundee-Crown's Driver Education Department offers students a comprehensive, fully-integrated, two phase program that covers a one term of time. The two phases consists of classroom and on-the-road instruction, these phases exceed requirements established by the State of Illinois. 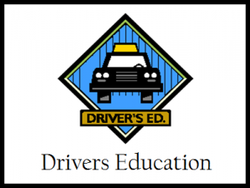 Before a student can enroll in driver education at Dundee-Crown, he/she must be a sophomore, at least 15 years of age by the first day of class, and must also have received a passing grade in at least eight (8) courses during the previous two (2) semesters, or have received a waiver of this requirement by the Superintendent or building Principal. For Further explanation of this law, contact any member of our driver education department. Students must pass the classroom phase to meet Dundee-Crown's graduation requirement (.5 credit hrs. ), and he/she must pass both the classroom and the driving phases to qualify for an Illinois license prior to age 18. Dundee-Crown also participates in the Cooperative Driver Testing Program with the Illinois Secretary of State's Office which allows Dundee-Crown's specially certified instructors to administer the State Road Test if the student receives an A or B in both the Classroom and the Laboratory phases of the program.